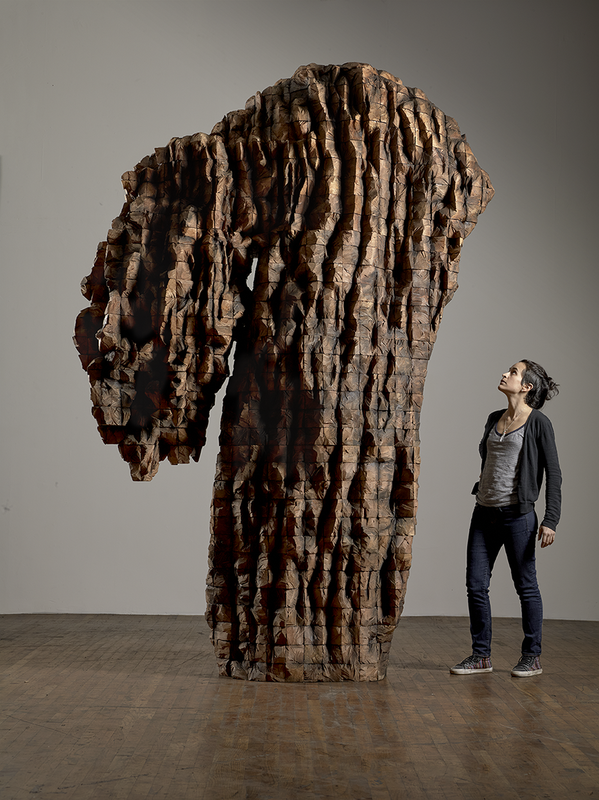 Ursula von Rydingsvard: The Contour of Feeling presents the artist’s monumental cedar wood carvings alongside newer works for the very first time. The poetic and expressive sculptures, which also utilize leather, linen, and other organic materials, reveal the process by which von Rydingsvard gives outward visual form to her innermost ideas and emotions. On view March 22–July 28, 2019, The Contour of Feeling marks the most ambitious von Rydingsvard exhibition to date in the United States and her first solo exhibition in Washington, D.C. Featuring 26 sculptures, a wall installation, and nine works on paper, the exhibition is guest-curated by Mark Rosenthal, formerly curator of 20th-century art at the National Gallery of Art, Washington, D.C., and organized by the Fabric Workshop and Museum in Philadelphia, where it was on view from April 27 to August 26, 2018. The daughter of a woodcutter from a long line of peasant farmers, von Rydingsvard spent several of her early years in the wooden barracks of refugee camps in Germany at the end of World War II. While von Rydingsvard resists biographical readings of her works, she speaks of those critical years as woven into her subconscious or instinct, which in turn leaves an imprint on her art. The Contour of Feeling centers on the creative flourishing of the artist’s recent career, anchored by a number of her early masterpieces. Among these is Untitled (nine cones) (1976), von Rydingsvard’s first major work in cedar and the earliest work on view in this exhibition. Subtle references to her family history are seen in Zakopane (1987), a wall installation of 22 fused vertical units with hollow vessels at the base. The sculpture commands the viewer’s attention with an altar-like presence that simultaneously recalls the tools used for labor by Polish peasants. Von Rydingsvard’s oeuvre also includes smaller works on handmade linen paper which are infused with surprising materials like knotted silk from a red scarf, tangles of thread, paper pulp, hair, lace, graphite and pigment. The collaged materials extend the boundaries of the paper, giving the delicate two-dimensional works a sculptural presence. The more intimate side of von Rydingsvard’s art is also evident in a wall installation that features her little nothings (2000-15), small objects collected and created by the artist, including strands of her brother’s hair, fragments of cedar, knitting and linen, and personal photographs. This entry was posted in Artist Spotlight, News and Updates, NMWA Exhibitions and tagged Ursula von Rydingsvard by Women in the Arts. Bookmark the permalink.